What a name! Apparently disco biscuit is another name for ecstasy. Who knew? Butter London did, that's who! 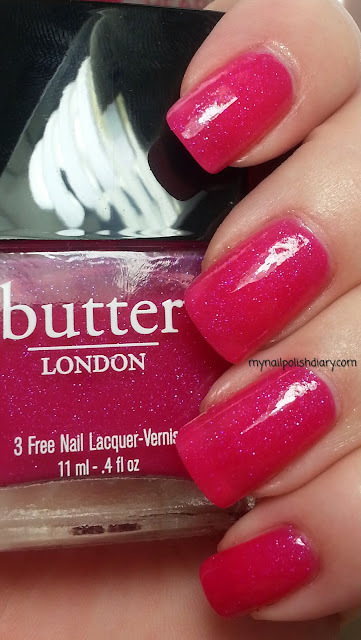 Disco Biscuit, from Butter London's Spring/Summer 2012 Collection, is a bright pink jelly with purple micro glitter. Isn't it lovely? I really love a jelly finish. This is actually my first Butter London. I'm really happy with it. It applied nicely and wore well too. I got it from their website a while back when they had a buy 2 get one free. Technically it was $12 off 3 but it's almost a free bottle since they're $14. Anyway, this is 2 coats with a coat of SV on top. In the sun the purple glitter just sparkles! Thanks for looking!